The new academic year brings big changes in campus dining options at Emory, and much of it is driven by two words: culinary integrity. This fall, that will translate into fresher, locally grown and sourced foods available in healthier, more globally oriented menu options, says David Furhman, with Campus Life communications. After a year-long process of reviewing proposals from campus dining providers — which also included feedback from the Emory community — a committee comprised of faculty, staff and students recommended switching from Sodexo to Bon Appetit Management Company as the university’s new food service vendor. The decision will affect both the Atlanta and Oxford campuses, he adds, noting that student meal plan prices will not rise this year as a result of the change. Bon Appetit is an on-site restaurant company that operates more than 500 cafes in 32 states, providing food service management to universities, corporations and other specialty venues. “Culturally, it was a good fit for Emory,” Furhman says. “They have been a leader in environmentally-sound food sourcing and sustainability, and they also take pride in cooking most of their food from scratch, with a greatly reduced reliance on processed food." Bon Appetit took over campus operations May 22, and already “we are serving vegetables that were grown at the Oxford Organic Farm and fresh bacon and ham from Savannah River Farms near Savannah, Georgia,” Furhman notes. “What is being served is local, fresher, and great for the environment, which puts us closer to balancing our sustainability goals,” he adds. Boar’s Head Deli will now be called “ITP” (Inside The Perimeter), with a menu that features new sandwich combinations and sides. All soups will be made from scratch on site. Maru will replace Star Ginger, offering sushi, Ramen noodle bowls and hot Asian entrees. Pasta John’s menu will expand to offer ready-to-serve baked pastas for diners on the go, with a focus on fresh ingredients. Dooley’s Grill will be renamed “Char’d House Grill,” specializing in 100 percent grass-fed beef, all-natural Springer Mountain Farms chicken and an updated menu. Beltline Pizza will feature dough made from scratch daily. The Cox Hall convenience store will be replaced by homemade, grab-and-go selections, providing both hot and cold entrees for hurried diners. The Green Bean will feature a heightened quality of baked goods prepared on site. 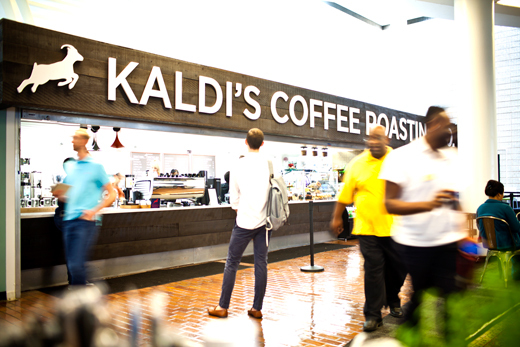 Dunkin Donuts has been replaced with Kaldi’s Coffee, a St. Louis-based family-owned business that serves locally roasted, 100 percent fair trade coffee. Diners will also find made-to-order sandwiches and salads. Menus at Dobbs Market will expand to include more global flavors, with an emphasis on locally sourced, healthy, made-from-scratch preparations. Eagle Convenience and Subs will sell produce provided by the Emory Farmers Market. Under the management of Bon Appetit, Dooley’s Depot will replace the former Zaya restaurant. The new menu “will be reminiscent of Zaya’s offerings, but it will be with fresher options and new items,” Furhman says. For the first time, Emory students may now use meal plan "Dooley Dollars" for food purchases each Wednesday at the Emory Farmer’s Market. A second Highland Bakery opens in the new addition to the Atwood Chemistry Center. Smaller than the Highland Bakery at Goizueta Business School, the new location features pastries, sandwiches, soups, salads and coffee, with plans to open the week of Aug. 24. The focus will be on local, lighter, healthier and less processed food, says Furhman.